The issue of genetically-engineered (GE), or genetically modified organisms (GMO), crops is not an easy issue for our community to tackle. It’s proven to be divisive in Boulder in the past and it touches on two things many of us hold dear, food and preserving open space land. The challenge for Boulder County Commissioners and Parks and Open Space staff will be to find a way to balance the concerns about GE crops with the need to do what is best for county-owned cropland. On the one hand is the anti-GMO activist perspective based in large part on a deep mistrust of Monsanto, the company that developed the technology, and the biotech industry in general. On the other hand is the argument that GE crops should be considered on open space land because they help farmers to soften the impact that farming has on the environment and help farmers to remain financially viable. The Cropland Policy is designed to address the gap between the Parks and Open Space department’s daily management practices and the County Comprehensive Plan’s directives regarding the management of open space and agricultural land. The policy will outline the guiding principles that our staff will use to make management decisions on open space properties managed as cropland. The anti-GMO activists would like to turn publicly-owned cropland into a place to take a stand in the war against Monsanto, the biotech industry, large corporate agri-businesses and globalization. They are urging the Boulder County Commissioners and POS staff to take a stand on this issue by just saying no GMOs on public land. In many cases, an underlying assumption of the anti-GMO position is that the fallback position is organic farming. It’s an easy mistake to make — at the grocery store, if we want to avoid genetically modified foods, we buy organic. Unfortunately, from a farming point of view, that just isn’t the case. Rather, the alternative to GE crops is conventional non-GE crops — the decision to make the transition to organic is not simple and looks at a whole different set of criteria. While we all might like to see more organic farming in Boulder County, the route to more organic production isn’t likely to come from banning GE crops. The barriers to entry for organic include both production and marketing challenges. Organic has proven successful on relatively small acreages, for instance 3-12 acres for a market farm or, in the case of a wholesale vegetable operation, up to 200 acres. However, scaling organic up for larger tracts of land and for crops like wheat, corn, barley, alfalfa and oats is a challenge that has not yet been successfully tackled in Colorado on a wide-scale basis. 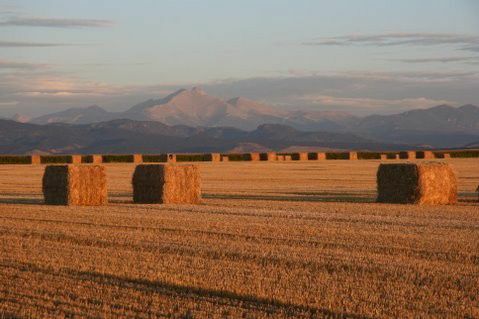 In addition to the production problems, there is the fact that there isn’t ready market or infrastructure in Colorado for organic grains and other field crops. Encouraging more organic farming in Boulder County and Colorado means tackling both production and marketing challenges. There is work being done in both of these areas, but solutions will take time. A big part of the reason that so many farmers have adopted GE technology over the past decade is that the technology allows them to lessen the impact of farming on the environment, something that matters to farmers even more than it matters to the rest of us. Without the option of using genetically-engineered technology, farmers will have no choice but to revert back to using conventional non-GE seeds and in the process, undo many of the conservation improvements that have been made over the past decade that have lessened agriculture’s footprint on the environment. The alternative to taking a political stand on the issue is to pursue a policy that is based on local environmental and economic considerations. The introduction of GE crops have enabled farmers to substitute less risky pesticides for more risky pesticides and adopt practices, like conservation tillage, which help to reduce soil erosion and improve soil health. No matter what happens with the GE policy, a core part of the Boulder County Parks and Open Space policy moving forward is likely to be the adoption of an Integrated Pest Management (IPM) policy framework with the goal of minimizing pesticide use on county-owned cropland. Boulder County is lucky because we already have many progressive farmers who have adopted many of the core IPM practices but these tactics should be encouraged and supported moving forward for all tenants. The challenge for Boulder County policy makers is to look past the exhortations to use our cropland as a battleground, to respond to the legitimate and relevant concerns about GE technology and to adopt a policy that promotes a way of farming that is healthier for farmers, healthier for the environment and healthier for the rest of us. While it might sound good to just say “No” to GE crops as a policy for Boulder County Open Space, it is important to not lose sight of the fact that there will be instances where a GE crop, used within an IPM program, could provide significant environmental and/or economic benefits to the county. In those cases, we need the option to say “Yes” to specific crops as a means towards protecting our environment (including people, water, soil quality, birds, insects and biodiversity) and promoting the overall economic well-being of the county. While I applaud you for trying to maintain a somewhat balanced approach to the decision facing the County about the use of GMO’s on our Open Space farmlands, I’m finding it very difficult give your argument much credence. I’ve read both of the articles that you penned for The Blue Line and I’m astounded that you seem to confuse the use of pesticides and IPM practices with the use of herbicides like Round-Up. These are two very different issues and farming practices are considerably different based solely upon the crops being farmed. I suggest that you might want to do some research, so you can get up to speed on the negative effects that Round-Up Ready seed products have already wrought throughout the mid-west. Our family farms over 1,000 acres in Missouri. We’ve done the research. We know the conventional wisdom and corporate line that companies like Monsanto use to sell their GMO seed products. We also know that the real story is much, much different than they’d like us to believe. We made the shift to non-GMO seed products about 5 years ago, counter to the advice of our farm management company. This was a conscious decision on our part. It was the right decision to make for us as farmers and the environment. Since you say that you’re concerned about “water, soil quality, birds, insects and biodiversity”, I encourage you to check out the following links, so you can make a more informed decision for yourself. If you’d like to chat about our experience in more detail, please feel free to make contact. L.